Don’t you love when your refrigerator is filled with vegetables? You open the door and all you can see is a bundle of colors. Unfortunately, today, I only had a bunch of broccoli left with a red bell pepper. The good thing is that tomorrow I am going food shopping with a friend of mine to the Berkeley Bowl! I am already excited about it. It will be her first trip there, I cannot wait to see her when she sees the fruits and vegetable section. Some girls enjoy going to the SPA or get a manicure, and I get the same excitement when I go to the Berkeley Bowl. How weird is that? Since I only had broccoli and bell pepper, I figured I would combine the two. I love those galettes dearly. They’re tender, melt in your mouth and so light! 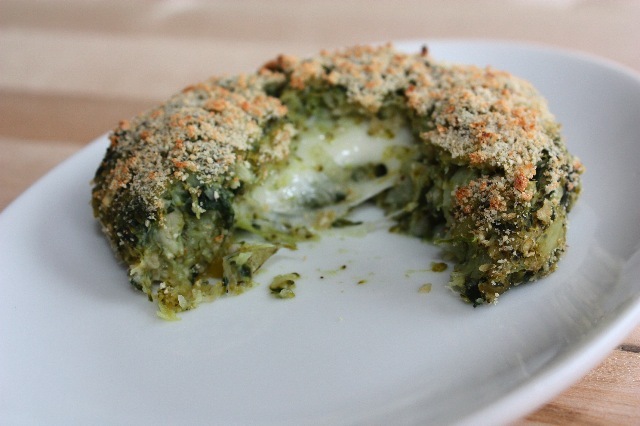 You can use any vegetables you like and substitute mozzarella with gorgonzola cheese as well. The vegetables just needs to have some consistency so you can mash them in a puree, so it’s better not to use any leafy vegetable. I mixed a little chopped spinach with it, but more would not have worked because of the liquid they tend to produce. 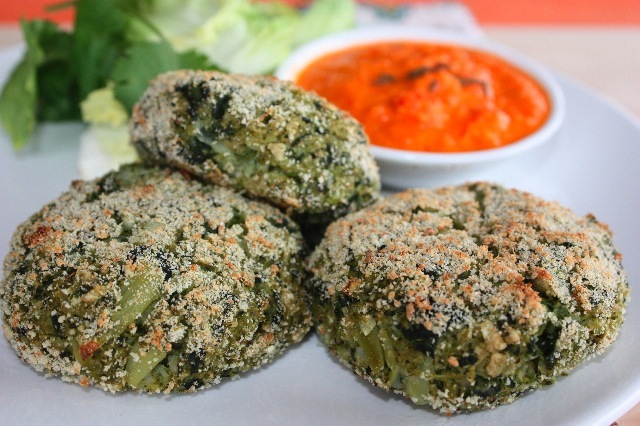 Those galettes are a good way to have your kids eat veggies, in case you have fussy ones. They won’t feel they’re eating vegetables, and the melting mozzarella in the middle is a selling point! I did not add too many ingredients to the galettes and lose the broccoli flavor, since the harissa sauce will enhance them. Harissa is a hot Middle Eastern sauce, served with couscous. You can buy it in tubes and delay it in water. I like to make mine with red bell peppers. You can serve those with a light salad, and you’re all set for lunch. Heat olive oil and brown shallots, add broccoli cut in small florets, salt and pepper. When broccoli are cookded mash them with a potato masher. Add defrost spinach and add to the broccoli. Add basil and garlic. Add enough water to the oats to form a thick paste. Add to the broccoli, and mix well. Take a small quantity in your hand and place a piece of mozzarella in the middle, close the ball well so that the mozzarella will not leek when in the oven and make a patty about 2 inches wide. Dip each side of the patty in bread crumbs. Cook in a pre heated oven at 375F for about 15-20 minutes, or until both sides are golden. Broil red bell pepper in the oven until the skin get charred. Remove from the oven, let cool. When cooled, remove the skin, and the seeds and cut in pieces. In a mixer, add red pepper and all other ingredients and mix to a smooth texture. Adjust with salt and pepper and serve with galettes. This entry was posted by silvia on July 29, 2009 at 8:44 pm, and is filed under Appetizers, Vegetables, Vegetarian - dairy. Follow any responses to this post through RSS 2.0.You can leave a response or trackback from your own site. Ca, il faut que j’essaie !! Surement delicieux !! These cute galettes make my heart go pitter pat, for real. I’m always looking for new ways to use broccoli, and this is definitely going on the list. Shazam — the gooey cheese looks like a home run. What a great way to have your veggies AND clear out the crisper in the fridge! Brilliant! on snap! these are right up the Rachel alley. I am usually in charge of apps for family parties so I do believe these will def be on the next menu. Oh, and I went to my first French restaurant while in DC and kept it traditional with escargot and duck confit. Boy, was I full at the end of that meal!! The galettes look beautiful and tasty.